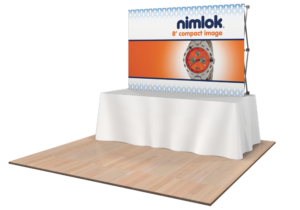 Nimlok Minnesota Compact Image collapsible tension fabric displays feature an integrated fabric graphic that makes it the fastest and one of the easiest displays on the market. Simply expand the collapsible frame and you have a fast and impactful display. Image Pro tension fabric display systems feature a collapsible straight silver frame and support a fabric graphic that attaches by simply pushing the graphic into a thin channel. The simplicity and ease of set-up makes this system ideal for use at fairs, trade shows and more. Leaf display systems are versatile stretch fabric popup displays. Add dimension to your event or tradeshow with unique, exciting graphic styles. Stretch fabric graphics come pre-attached to the frame, making assembly easy and fast. Graphics adhere to the hubs using push-fit attachment technology. 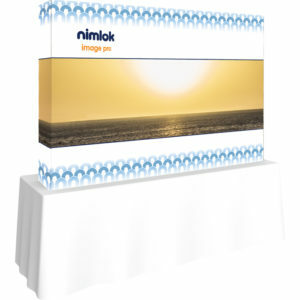 Nimlok Wave displays are increasingly-popular because they are high impact, lightweight and fast! Nimlok’s Wave displays are great options that feature tension fabric graphics, come with lifetime warranties and roll-able, portable shipping cases. 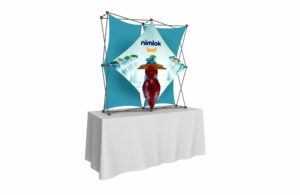 Nimlok Compact Pop Up displays will suit both your budget and portable display requirements! And, one of the best features is that all Nimlok Compact Pop Up frames come with a worry-free, unconditional lifetime warranty, guaranteed. Simply open up the lightweight frame, attached the magnetic bars to support your graphics, add on the lights and you are ready to go. The durable wheeled transport case even transforms into a counter for use with your display.